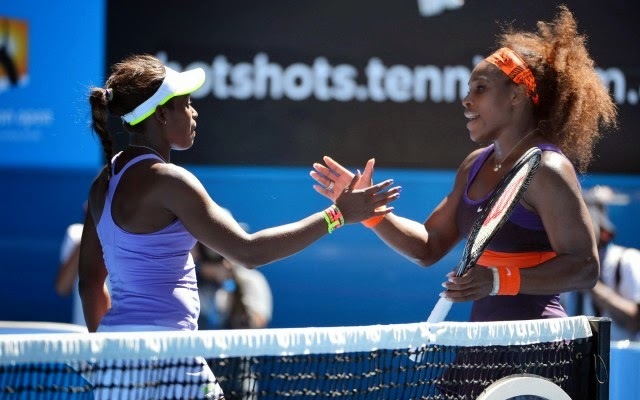 Serena Williams and Sloane Stephens: What else would you expect? “I’m annoyed. I’m over it,” she says of all the Serena comparisons. “I’ve always said Kim Clijsters is my favorite player, so it’s kind of weird.” She attributes the media hype over her relationship to the star to “just being African-American and them wanting to link to something.” Then she begins to tell the story of when she was 12 and first saw Serena play. Her mom took Sloane, her younger brother, Shawn, and her stepdad to the Fed Cup in Delray Beach, Fla., and the family waited around all day for the Williams sisters to sign their posters. But wait. There’s more. Writer Marin Cogan describes a Williams-Stephens relationship that was never particularly close and deteriorated rapidly after the latter upset the former at the Australian Open in January, with Williams unfollowing Stephens on Twitter, Tweeting a cryptic put-down – “I made you” – and not saying “one word” to Stephens or “looking her way” since the match. All of this, of course, flies in the face of the narrative propagated before the same match, when reports suggested that the two players were the tennis equivalent of Luke and Obi-Wan, with Williams in the role of sage Jedi Master. The last part is why I need a fainting couch. Serena Williams, tennis mentor? To a rival player who’s actually, you know, good? Ah ha ha ha ha ha. Ha. Okay. I’m better now. Just had to let that out. But seriously: do tennis writers actually watch tennis? I know that the Gracious Vet Giving Back to the Next Generation is a comforting sports trope, right up there with Undersized Scrappers Sporting Oversized Hearts and Father-Son Catch as Proxy for Genuine Emotional Connection. I also know that sometimes – once in a rare, rare while – it’s even true: witness former New York Jets fullback Tony Richardson helping train his replacement, John Conner, a few years back. Mostly, though, it’s balderdash. There is no Circle of Sports Life. There’s just brutal, survival-of-the-fittest competition. Particularly in tennis, where there are no teams and players eat what they kill. That said, you don’t have to be an athlete to relate. Think of this way: you have a job. You’re good. Well-paid. You’ve been doing it for a while. Along comes an intern. The intern is good. Could end up as good as you. Could end up taking your job. Are you really going to help said intern out? Pay it forward with a friendly smile? Or are you going to crush them underfoot, then enjoy listening to the lamentations of his or her women? Brett Favre didn’t exactly tutor Aaron Rodgers. Joe Montana wasn’t concerned with helping Steve Young become all he could be. I covered the Washington Wizards when Michael Jordan made his creaky-kneed, mostly-forgotten comeback: his Airness was downright cruel to rookie Kwame Brown and had talented shooting guard Richard Hamilton shipped to Detroit for being sufficiently non-deferential. Why would Williams be any different? Why did people miss the obvious? Was it due to race? Gender? Wishful thinking? I truly don’t know. But after a decade-plus of covering sports – and plenty of time living in the world – I do know this: great people help others. Great champions help themselves.